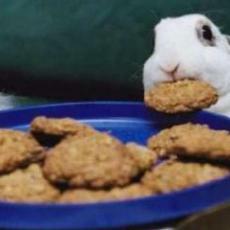 Cook healthy treats for your pet rabbit! Preheat the oven and combine the wet and dry ingredients separately. Slowly combine the ingredients into a dough, flatten the dough across a baking sheet and cut the dough into squares to break apart later. Poke a hole in each square with a toothpick, bake the bunny treats and allow the treats to dry completely in the oven.